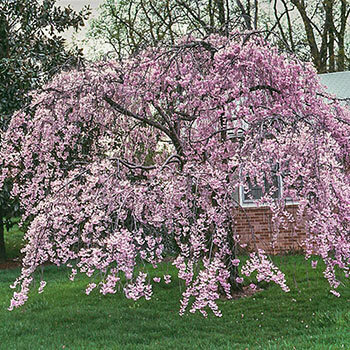 Combines two of the most romantic things trees can do—the elegant weeping form, and a wealth of heart-wrenching blooms bunched and tumbling from each branch. It stands out so well, it easily makes a strong focal point. Put it in front of your house and it'll become the landmark people use in giving directions. The single and double blooms attract pollinators—and it could not get more picturesque than seeing butterflies lacing through the limbs of this tree. Of course, you can also use the curving branches and pretty flowers as indoor décor, too. The Pink Weeping Cherry Tree is a pleasure to grow, as it's surprisingly easy and very adaptable to many soil types. Once you get it established, it'll be moderately drought tolerant, too. Flower Form: Single to double blooms. Pruning: Keep pruning to a minimum. Only cut out crossed branches or badly placed ones. Early summer - sap bleeding is less likely. Winter Care: Plant in a sheltered area, away from bitter winter winds. Additional Information: The fruit that develops later in the season is ornamentally insignificant. Squirrels and other small mammals are the only ones interested.